The Handover Blog Carnival – Closing Down….. It is with a heavy heart and a feeling of regret that I am shutting down ‘The Handover’ EMS Blog Carnival. It has been running for a little over a year and I hope it has brought alot of blogs to you that you may not have found without it. I have had a great time administering it and it has been a fantastic way for me to ‘meet’ many bloggers which I may not have done without it. I still think that it is a great idea and is needed in the EMS blogosphere, but I realise that my focus has shifted and I am not doing it justice with my current workload. “Ahhh, back in the day.. Waaaay back when blogging was new.. And just an innocent “hobby” if you will, you created The Handover.. It was something that brought us all together, that burgeoned our fledling stat counters, and made us rite gud schtuff on our new bloggie things.. Flash forward to today and there’s deadlines, obligations, fans, and even twitter. The days of the creation of The Handover seem almost nostalgic.. Like the “good ol’ days”. Thank you to all that have hosted the Handover and thank you to all who submitted posts. I hope you got some new readers from it, and you now have more people to share the wonderful work that we all do in this crazy profession. Make sure that you go along to The final Edition hosted over at Life Under The Lights next Tuesday. I know that Chris has something special planned…..
Oh, and if by coincidence, one blog carnival ends as another begins. The ‘First Due’ Blog Carnival is a new and has just opened with its first edition over at FireCritic.com. This one is intended for Fire Fighters, but as I have learned, many of my US brothers and sisters are both Firefighters and EMT`s, and I will be looking forward to each edition eagerly. 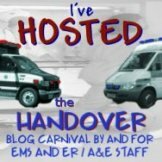 There is still a need for an EMS Blog Carnival. It would be great to see someone take up the mantle and either continue the Handover, or start anew with something else. You can catch up with archive edition links here. So, thats it. The Handover is done, just need a signature now……………….. I'm still in the good old days! Sorry to see the Handover go. Fun while it lasted though!